which is on the northern tip of the southern end of the island. Drive SOUTH along Queen’s Highway. Stay on the main road until you get to Waterford. In Waterford, the road will come to stop at a “T” junction. Go RIGHT at the “T”. 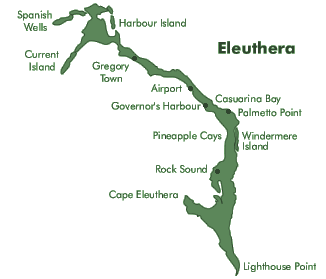 You are now 10 miles from Cape Eleuthera Marinaa. There will be a guard gate (sometimes un-manned) going into the marina. Tell them you are going on a tour. Drive straight into the marina and we are the first boat slip closes to the office and fuel pumps. You can park in one of the spaces across from the office/ship’s store, or there is a parking lot on the left just before you reach the Marina buildings. There are bathrooms behind the ship’s store and you can buy beverages, ice, and snacks at the store if desired. Drive SOUTH on Queen’s Highway. South of Rock Sound you will see a paved road on the LEFT named “Chris The Fireman Brown Blvd” and a concrete sign for Cotton Bay. Turn LEFT here. When you get to Wemyss Bight you will come to a fairly large intersection with a paved road crossing your road. Turn LEFT here. There will be a ballfield/park on your left just a few yards down. Follow this road all the way to Bannerman Town. When you get into Bannerman Town, follow the paved road when it makes a hard right. Wait for us in the park that is just before where the road makes a hard left. Drive SOUTH along Queen’s Highway. Stay on the main road until you get to Waterford. In Waterford, the road will come to stop at a “T” junction. Go RIGHT at the “T”. In Deep Creek, you will pass the school on the right. Watch for the 2nd church on the left after the school. There is a small bell tower here and a dirt “dock” that goes out into the creek next to the church. Park off to the side. This is your takeout location. We will pick you up here and drive you to the kayaks. Drive SOUTH along Queen’s Highway. Stay on the main road until you get to Waterford. In Waterford, you will come to a stop at a “T” junction. Go LEFT at the “T”. Pass the entrance to Davis Harbor. The next paved right is the road out to Waterford Beach. Turn RIGHT here. Drop your fellow kayakers at the beach (you should see the kayaks). The driver(s) can take the car(s) to the Parking/takeout point in Deep Creek.